Have you ever eaten any KOHYA-TOFU before? This is a tofu product which is first frozen then dried. When you prepare the tofu, you can soak it in warm water first to rehydrate it before you use or cook it. It will also get softer and absorb a lot of dashi / soup and umami during cooking. I put some ground turkey and a green onion mixture with a lot of fresh ginger in the middle. Then simmered it in a soy sauce based-dashi soup stock. After it's cooked, I tied it with boiled Mitsuba twig around it like a ribbon for a little better looking presentation. As same as other soy products, KOHYA-TOFU is also very high in nutrition, especially calcium, and iron. There is also an effect which lowers cholesterol in your system. However, I don't think too many Japanese people eat this nowadays, especially young people. I would love to re-introduce this great food here in the U.S., too. 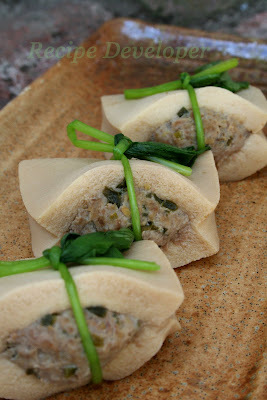 But I also hope that more Japanese people will start cooking and eating KOHYA-TOFU more often as one of our great food. I'm surprised that you used turkey! I love it, but I haven't found it anywhere since I moved to Japan. Would chicken be a safe substitute? 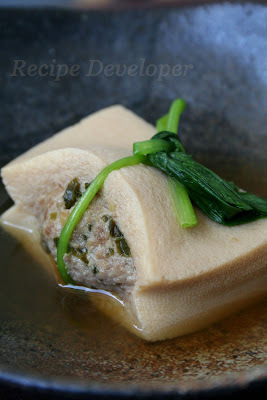 Nimono style khoya-tofu with grandmother's cooking? That sounds realy good! I don't know that which part of Japan your wife's grand mother is living, but it must be nice home cooking. Last night, all of a sudden, I remembered where I had eaten khoya-tofu! In Miyagi, it's one of the ingredients in ozouni. I have it every New Years!